Free downloads of PDFX-ready for breakdown-free print production. The preflight profiles are documented separatly. 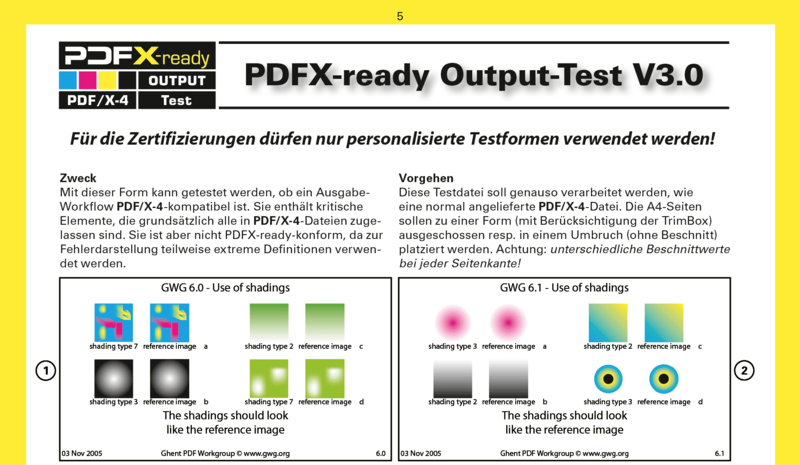 The PDFX-ready Output Test pages can be used to check an output workflow for PDF/X-4 compatibility. The test pages are using the test patches of the Ghent PDF Output Suite 4.0. The four pages should be process like delivered jobs from customers using the entire workflow. Processing errors violating the PDF/X-4 standard are clearly indicated. In such cases most test elements render a thick X, others deviate from the adjacent reference object (usually pre rendered images). The PDFX-ready Guideline covers the entire workflow from the creation of images and illustrations, the design of the layout, the correct PDF export, preflight and output of PDF/X files. This guideline concentrates on the PDF/X-4 workflow using CMYK and spot colours. Each double page is dedicated to a particular topic. You don't have to read the entire guideline from the beginning to the end. The reader can easily switch between topics (e.g. using the bookmarks in the PDF). Instead of a conventional table of content the guideline is using an illustration of a typical PDF/X workflow. The page numbers have links which open the corresponding pages.